Having good oral health takes discipline, no matter what your mouth is like, but extra time and care is required for those with braces. Braces create more places where food particles can get trapped. This means more time spent on brushing and flossing. 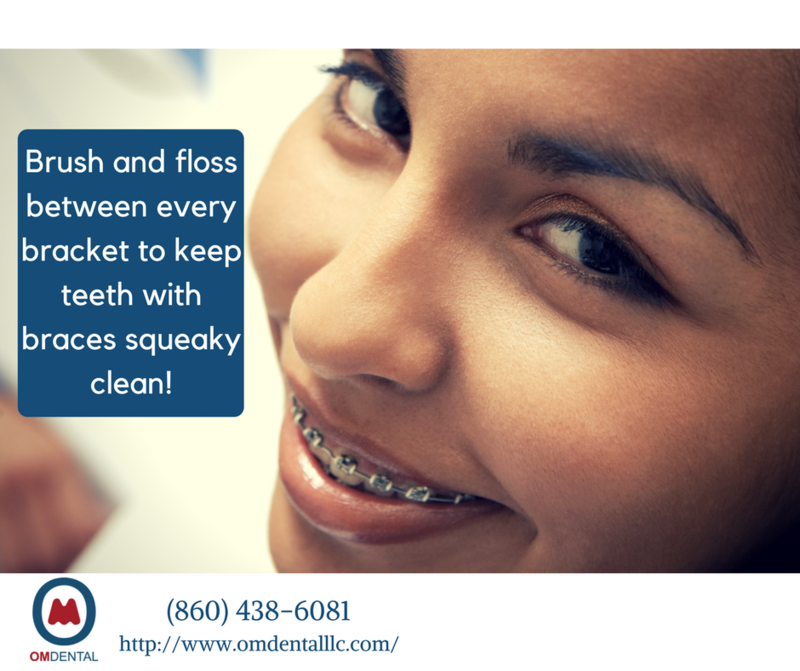 It's especially important to keep braces clean because poor dental hygiene can lead to a multitude of problems for those with braces. Discolored teeth, inflamed or infected gums, tooth decalcification, and cavities may wreak havoc in your mouth if dental hygiene is not addressed promptly. Here at OM Dental, the best dentist in New Britain, we provide dental care for all ages. Adolescent orthodontic care is one of our specialties. Reach out to our team if you'd like to schedule an appointment, and here are some tips on how to take care of teeth while braces are still in the picture. • Avoid foods that could cause problems. Apples, taffy, popcorn, raw carrots, and caramel are all difficult to chew and can cause tooth pain or get stuck in the braces. Focus on easy-to-chew foods, and enjoy the popcorn when the braces come off! •	Drink lots of water after meals. This will help wash loose food particles out of your mouth that you won't have to spend time brushing. Make sure to swish the water around your mouth to get food from every little corner. • Don't use teeth-whitening products while you still have braces. Teeth-whitening toothpaste and mouthwash will only whiten the parts of your tooth they touch. The bits of tooth hiding beneath your braces will stay the same color and you'll have an outline in the shape of your braces once they come off. If you have concerns about teeth-whitening, get in touch with us at OM Dental, the best dentist in New Britain, and we will answer your questions. • Choose an electronic toothbrush designed to clean teeth with braces. It's more difficult to clean out your mouth with a brush that was created without braces in mind. You'll have an easier time keeping things clean if your brush actually fits in your mouth! • Whatever you do, do NOT forget to floss! Braces create extra places for food particles and plaque to stick around, so flossing is doubly important for those with braces. Use a floss threader to make the process simpler. Make sure to floss between the teeth and the archwire, and don't forget to get in between all of the brackets. If you take extra care of your teeth during your time with braces, your new smile will shine even brighter! If you'd like to know more about orthodontics, please schedule an appointment today. Our dental professionals will be ready to answer your questions. Visit our website omdentalllc.com to learn more!